In Congress, July 4, 1776. A Declaration by the Representatives of the United States of America, in General Congress Assembled.... Philadelphia: John Dunlap, . 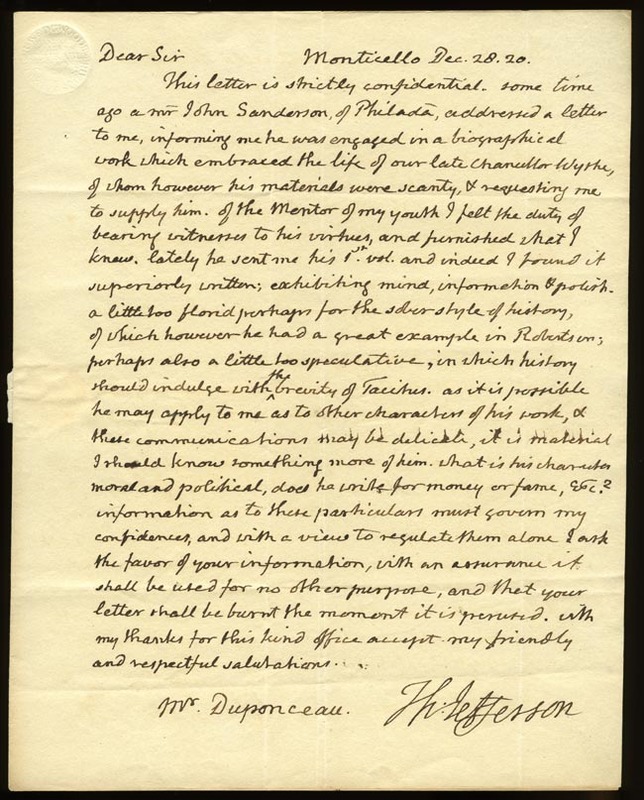 In June of 1776, Thomas Jefferson, thirty-three years old and already a well-known and accomplished writer, faced an enormous task: to draft a declaration of independence for the American colonies. Drawing on contemporary documents, Jefferson, with help from John Adams and Benjamin Franklin, drafted the seminal document of American history—what he would later call "an expression of the American mind." 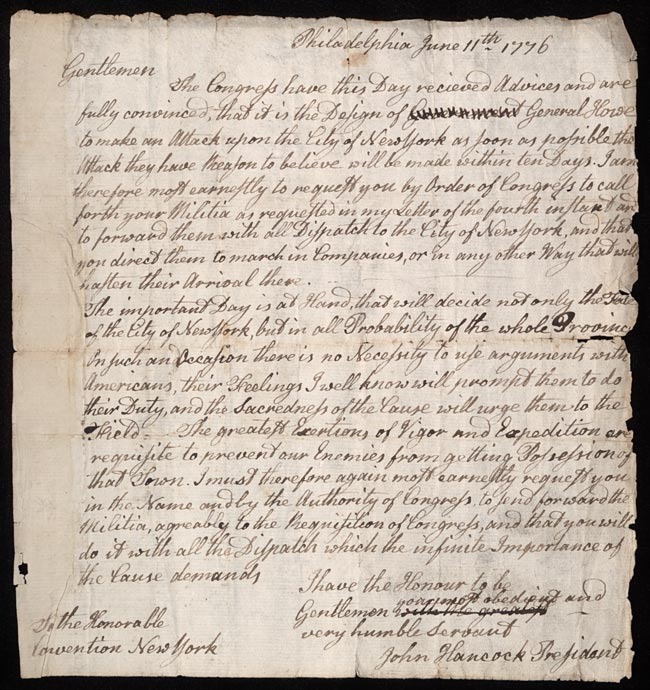 The story behind the Declaration of Independence, from its first printing to popular nineteenth-century facsimiles, is illuminated through the Albert H. Small Declaration of Independence Collection—the most comprehensive collection of letters, documents, and early printings relating to the Declaration and its Signers. The collection traces the writing, printing, and dissemination of the Declaration of Independence in 1776, and subsequently, its remaking in the years after the Revolution into the American icon it is today. Documents and letters from the Signers bring to life the stories of the individuals who took great risks at that pivotal moment in American history. Highlights of the collection are on permanent display in the Declaration of Independence Gallery at the Albert and Shirley Small Special Collections Library. On July 4, 1776, the Second Continental Congress voted unanimously to adopt the Declaration of Independence based on Jefferson's draft. John Dunlap, the official printer for Congress, worked through the night and into the next morning, printing the text of the Declaration onto broadsides-single-sided, printed sheets. Early on July 5, John Hancock dispatched these broadsides to be read, posted, and reprinted in order to announce the colonies' independence. The centerpiece of the exhibition is a John Dunlap broadside-one of only twenty-five extant copies. The Declaration's text first appeared in a newspaper on July 6, 1776, in The Pennsylvania Evening Post. 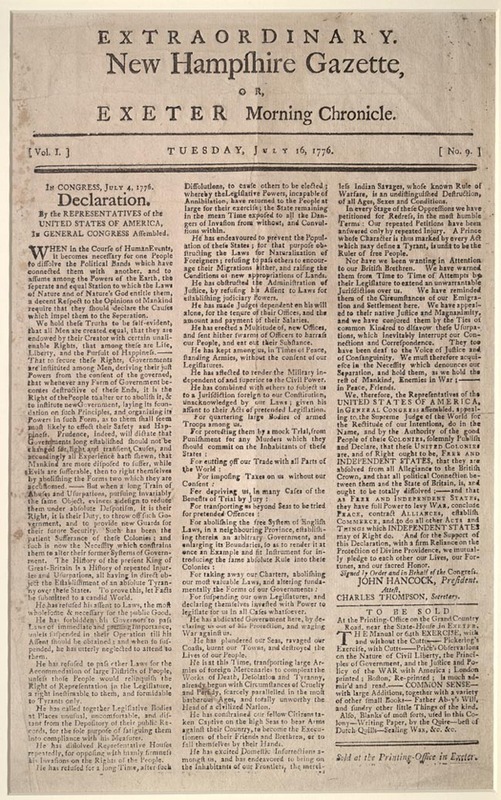 Additional newspaper and state printings on display demonstrate how news of independence spread from Philadelphia throughout the colonies-a process that relied on local printers, messengers traveling on horseback, and public readings of the Declaration in town squares, churches, and military encampments. Most of the signers of the Declaration suffered significant losses in family and fortune as a result of their association with the Revolutionary cause. 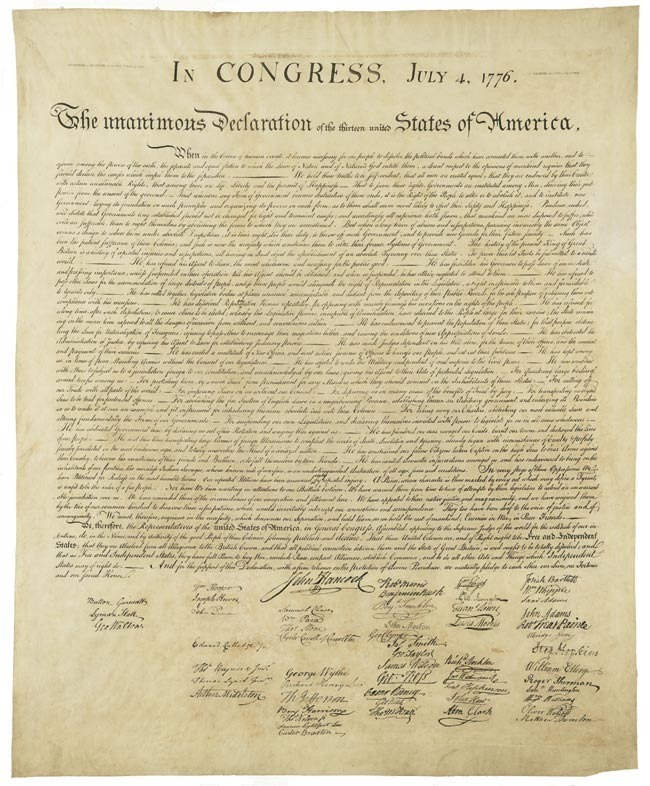 The Albert H. Small Declaration of Independence Collection includes a set of autographed letters and documents representing all fifty-six signers. 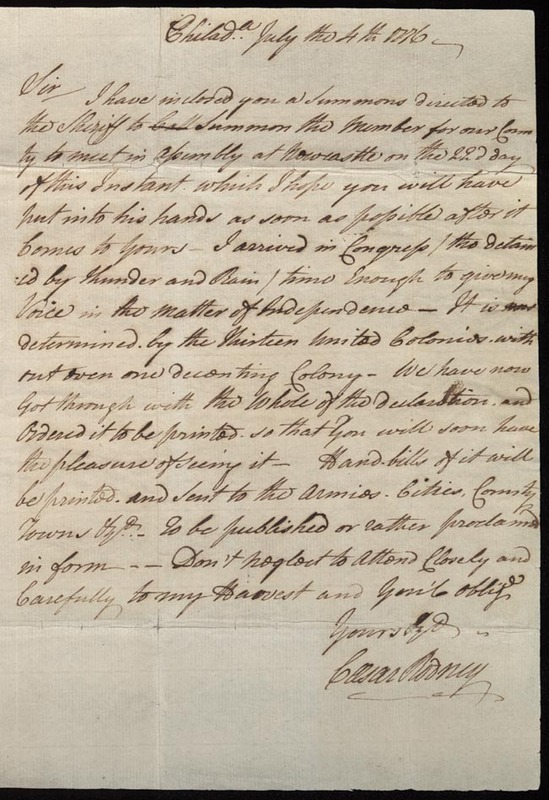 The signers' letters, many of which are on display, contain important details about military matters and wartime events. Early nineteenth-century letters document the discussions among the signers about the Declaration's legacy and their own place in history. Benjamin Owen Tyler's subscription book for a facsimile of the Declaration of Independence, 1815-1818. (MSS 12143). Front Cover. The exhibition highlights rare and unique printings of the Declaration made in the years after the Revolution. In 1815, the United States concluded its second war with Britain, the War of 1812, and American nationalism blossomed in its wake. Reinforcing this renewed patriotism, the passing of the signers' generation created a passionate interest in all things associated with the nation's founding. Several entrepreneurs sought to capitalize on this demand by rushing to produce the first facsimile printings of the Declaration of Independence -- offering the American public its very first look at the document. Benjamin Owen Tyler's subscription book, (MSS 12143). Page 7. In 1818, Benjamin Owen Tyler produced the first facsimile of the Declaration-an elaborate, painstakingly hand-copied engraving. The next year, Tyler's business rival, John Binns, published a monumental, illustrated engraving of the Declaration. On display in "Declaring Independence" are these rare, early printings, as well as the subscription book in which Tyler took orders for his facsimile. His subscription book contains the signatures of Jefferson, James Madison, John Quincy Adams, and other notables of the new republic. In response to the competing printings, Secretary of State John Quincy Adams commissioned William J. Stone to produce an official facsimile. In order to capture the exact image of the officially inscribed, or engrossed, Declaration, Stone likely moistened its surface in order to transfer some of the ink from the original onto his copper plate. This would help explain the poor condition of the engrossed Declaration now at the National Archives. In 1823, the State Department printed two hundred of Stone's engravings on parchment. A congressional resolution specified the distribution of these documents; on display is one of the two copies presented to the Marquis de Lafayette. In the years since the Revolution, reform and political groups from abolitionists and secessionists to labor unions and civil rights activists have used the words of the Declaration to support their causes. The collection includes examples of these reinterpretations of the Declaration of Independence, illustrating its lasting impact on American society.